Commemorating World Wetlands Day community resilience to climate change. In Tana River Delta and Yala Swamp, Nature Kenya has supported the formulation of landscape level land use plans, informed by strategic environmental assessment. Currently Nature Kenya is implementing a project funded by the Darwin Initiative. The project’s primary goal is to catalyze the implementation of the Tana Delta land use plan in Lamu and Tana River counties through the establishment of multiple use Community Conservation Areas (CCA). 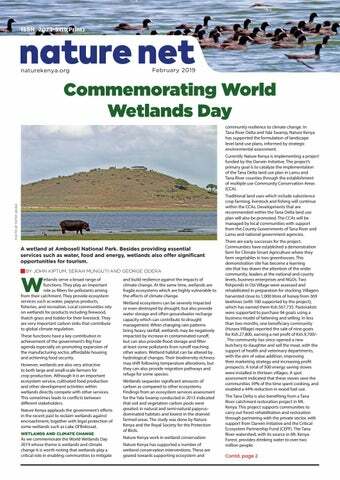 ACTION Commemorating World Wetlands Day Contd. from page 1 In Yala Swamp, Nature Kenya in 2014-2018 implemented a program whose goal was to secure the future of the swamp, recognizing both development and conservation needs. The Yala Swamp land use plan was formulated, informed by a strategic environmental assessment. Some 8,400 ha of community conserved areas (CCAs) were identified within the swamp with a committee established to manage, guided by a draft management plan. The program was supported by the Darwin Initiative, MacArthur Foundation and USAIDPREPARED. Within the CCA, 320 ha of degraded areas were planted with papyrus. Local farmers were supported to plant 186,293 indigenous tree seedlings in the lower River Yala riparian area and on farms. This has led to increased tree cover and rehabilitation of 175.41 ha, upstream of the Yala Swamp. The wellbeing of Yala Swamp communities has also improved. Eleven fish ponds were established and 156 households benefited from the harvest of at least 9.2 tons of fish. Households made up of 448 individuals earned a total of Ksh.224,950 from sale of high value papyrus products by the end of 2018. Energy saving stoves were installed in 2,000 households and 177 schools; this has seen consumption of wood fuel in households and schools reduce by 50%. Other initiatives include training of 113 community tour guides who currently engage in eco-tourism as a source of livelihood, and carry out biodiversity monitoring within the swamp. The main legacy of the program was the establishment of Yala Ecosystem Site Support Group, made up of 55 community-based organizations. The Site Support Group coordinates conservation work in Yala Swamp even after the program came to an end. For instance, on February 2nd the group will coordinate Siaya County level World Wetlands Day Celebrations with key activities aimed at creating awareness on the importance of the swamp in climate change adaptation and mitigation. Putting boots and more on the ground in Arabuko-Sokoke Since its relaunch in 2016, Friends of ArabukoSokoke Forest, a Committee of Nature Kenya, has been putting ‘boots on the ground’ to support Kenya Forest Service and Kenya Wildlife Service to protect this treasured forest. This was further boosted when in 2017 FoASF received funding from the Minara and Oak foundations to train and employ 10 community scouts and carry out daily patrols to help heighten the security of the forest. Through these patrols the Friends of ArabukoSokoke’s profile has been greatly increased and they are seen as one of the key protectors of the forest. Arrests have been made and snares and logs confiscated. Check our website <https://www. friendsarabukosokoke.org> or Facebook page for more information. And when next at the coast do visit the Arabuko-Sokoke Forest! and was relaunched following a critical threat to the forest from oil and gas exploration surveys. Its more than 200 ‘friends’ are drawn from individuals, people from the local community who are passionate about the conservation and sustainability of the forest, academia and commerce. NATURALIST HELP MONITOR MAMMALS IN KENYA The Mammals Atlas for Kenya (MAKE) project gives you a chance to contribute to science. The distribution of different mammal species in Kenya is not well known. Information about the existence of different species in many places in and outside protected areas is scattered in different publications, online databases and personal field notebooks. Hence there is need to consolidate this data into a single database and produce up to date distribution maps for different species of mammals. To do this, the Mammalogy Section staff and other members of the Mammal Committee of Nature Kenya would like you to assist in the citizen science mapping of the distribution of mammal species in Kenya. You can do this by contributing the following information: 1. Striped Leaf-nosed Bat (top) and African Trident bat (bottom). bright Sirius. Lower in the northern sky, five bright stars form a giant pentagon. This is the constellation of Auriga, the Charioteer. The brightest of the five is the star Capella – which is actually two stars. Planets, Feb ‘19 Mars, fading now, is high in the west, setting before midnight. The crescent moon is near Mars on Feb 10. In mid-month, the small but bright planet Mercury rises above the sunset for the rest of the month. Three bright planets are in the east before dawn: Jupiter is now the highest, brilliant Venus is slowly dropping back, while Saturn rises. Venus and Saturn seem to pass each other on February 17-18. The moon appears very close Saturn on Feb 2; then the moon is near Jupiter on Feb 28, near Saturn on March 1-2, and near Venus on March 3. Moon, Feb 2019 Feb 4 –new moon. Feb 12 – first quarter. Feb 19 – full moon, closer than usual, so appearing slightly bigger and brighter. Feb 26 – last quarter. Feb sun During February, the sun rises and sets later than usual – rising after 6:40 am and setting after 6:50 pm in Nairobi. KENYA’S KENYA’S WILDLIFE: A SUCCESS STORY STILL WILDLIFE: IN THE MAKING? A SUCCESS STORY STILL IN THE MAKING? What strides has Kenya made in wildlife conservation and what remains to be done? What strides has Kenya made in wildlife BY DR. DAVID WESTERN conservation and what remains to be done? Birders Please Note! 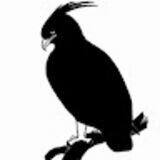 The Wednesday Morning Birdwalks meet at 8:30 am at the Nairobi National Museum. Transport is on a self-help basis. The group meets in the courtyard of the Nairobi National Museum, past the entrance to the galleries. We normally return at about 12:30 pm. The Sunday Birdwatch on the THIRD Sunday of each month now also meets at 8:30 am, at the same location. It is a day trip; please bring water and lunch.